As you may know the holiday season is fast approaching (for some of you it may already be here) and I am taking some…well holidays. So I will not be posting here for a few weeks or responding to any of your comments, I will respond to all the comments that I receive when I get back. I hope that everyone has a happy holidays and gets all the time that they want to learn python! Also, PyGame 1.8 is going to be released on December 22nd (hopefully) so you may be able to put some 1.8 into your games before Christams eve! i’d like to ask you if you know how to use new statusicon in pygtk since 2.10. I cant find any example on the net. 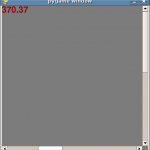 Pygame 1.8 for 22? I Don’t think so. xrado – hmm PyGTK statusicon…nope sorry I don’t know too much about that, but maybe I’ll look into it and write a tutorial. Wfox – Turns out you were right! They still haven’t released it, but it is in RC3! Next Next post: Back from holidays!